Our rescheduled Ukulele Fest is on! See you there. 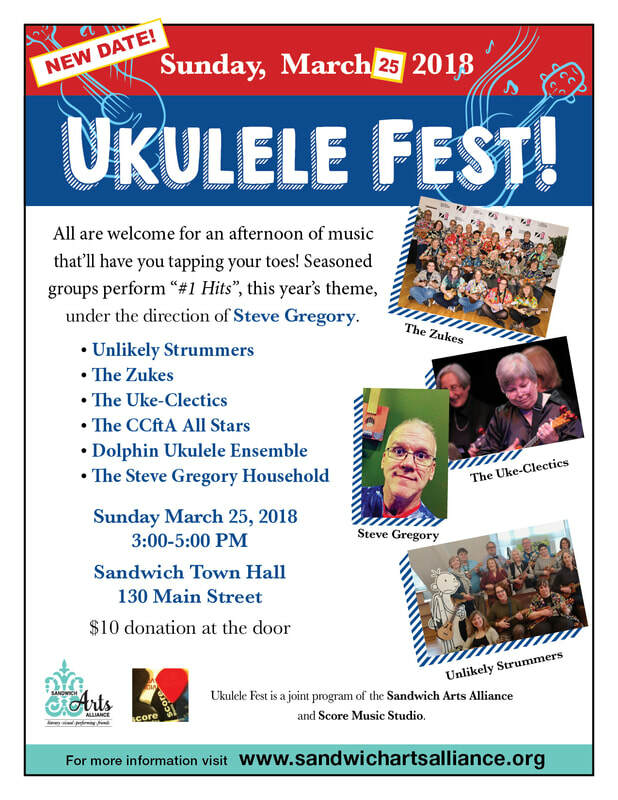 It’s time once again for the Annual Ukulele Fest, a joint effort of the Sandwich Arts Alliance and Score Music Studio, under the direction of Steve Gregory. Originating in Portugal, the ukulele is most closely associated with Hawaii as Portuguese instrument-makers emigrated to the Big Island in the 1880’s. The ukulele is enjoying a resurgence of popularity in recent years. This four-stringed cousin of the guitar comes in four “flavors:” soprano, concert, tenor, and baritone. Ukulele music can be complex or comical, and it’s always entertaining. that’ll have you tapping your toes....and maybe leave you longing for a ukulele of your very own. The CCFTA All Stars are a group of Ukulele players based at the Cotuit Center for the Arts. Their fearless leader, Steve Gregory, has been coaching the Allstars how to enjoy music and learning since 2012. CCFTA Uke Classes are held on Saturday mornings and often lead to strummin', hootin' and hollerin'. Steve Gregory is the Owner of Score Music in Sandwich where he teaches Guitar, Ukulele, Classes and a bunch of other stuff. He plays guitar and sings with the Cape Cod jazz / pop duet, Two Cool and the group, Inside Out. He is the founder of the Cotuit Center for the Arts Ukulele Orchestra series of classes which has been spreading Ukulele fun across Cape Cod since 2012. Steve is also the Saturday Service Music Director at West Parish Church in West Barnstable. Uke-Clectics, so named because of our interest in a wide variety of types of music. Founder, Judy Jollett, has structured the group to teach each other. We saw also enjoy incorporating other instruments into the songs, and on occasion you will hear clarinet, steel drums, saxophone, fiddle, or djembe. The Zukes are part of the Creative Classroom at the Zeiterion Theater in New Bedford, Massachusetts. Under the direction of George Anzivino there are four levels of instruction, Beginner Levels I and II, Intermediate, and Advanced can take students from never holding a ukulele to advanced note reading and ensemble playing. Though primarily an educational group the Zukes occasionally perform in the community for events at places like Nursing Homes, the Middleboro Historical Society, and Viva Portugal. Featuring ukulele players from across southern MA, the Unlikely Strummers are based at An Unlikely Story bookstore, in Plainville. They are co-directed by Cindy Miller and Lisa Cohen.